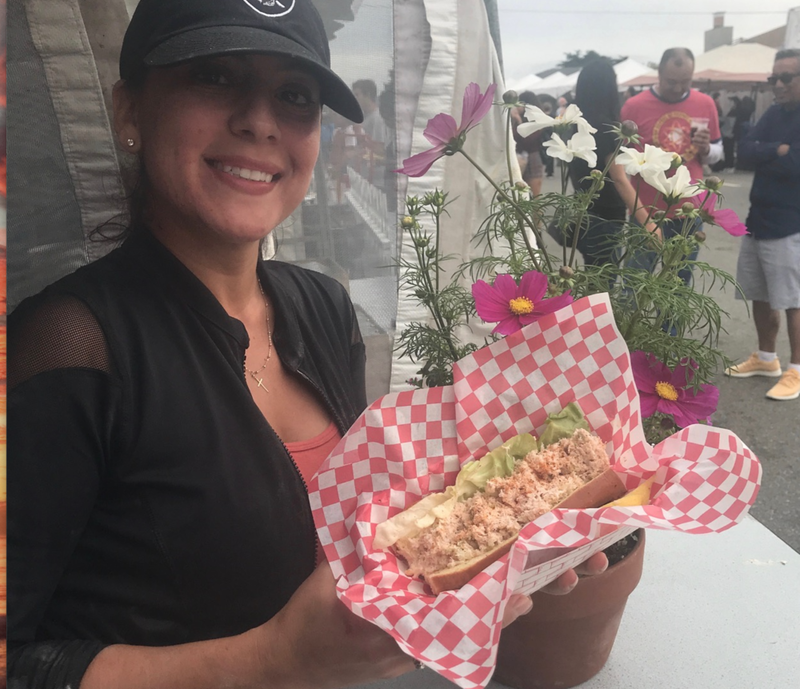 From our beginnings on the dock in Ketchikan, Alaska to the streets, towns and music festivals of California, we have been serving high quality festival fare since 1986. We are a committed bunch who care deeply about the gourmet quality of our food, the speed of our service and the satisfaction of our customers, and we do it all with a fun spirit and upbeat attitude. We look forward to serving you this festival season. We offer a variety of delicious items which can be combined to satisfy the demands of any event! Our beer battered garlic fries topped with our homemade crab aioli and Dungeness crab. Crab meat with our homemade Crab Aioli, drizzled with warm butter and served on a grilled Artisan Roll. Tender but crispy beer battered fries tossed in our fresh garlic-parsley pesto. Regular, hot link or soy-veggie hot dogs hand-dipped in our healthy, corny homemade batter. Grilled German Sausage, Polish Sausage or Irish Banger Sausage hand-dipped in homemade batter. Tender Monterey Bay Calamari lightly marinated in lime juice, dipped in egg, breaded in our own dill breading and fried to perfection. Served with fresh lime wedges and our creamy-lime-watercress pesto sauce. fried Napa cabbage, shredded corned beef and green onions. Beer battered garlic fries topped with our stone ground mustard aioli, grilled sauerkraut and bratwurst. Greek spiced beef or grilled chicken served on a grilled Greek pita brushed with olive oil and garlic. Topped with freshly sliced Roma tomatoes, cucumbers, red onion, leaf lettuce and homemade sour cream-cucumber-dill sauce. Grilled chicken topped with homemade creamy pesto sauce, Swiss cheese, grilled onions and organic spring mix. Wrapped in a warm Greek pita. Freshly fried falafel, sliced tomatoes, cucumbers, red onion, leaf lettuce served on a Greek pita with our lemon-tahini sauce. Offered with a choice of Greek spiced beef, chicken or falafel. Mixed greens with thinly sliced Roma tomatoes, cucumbers and red onions. Topped with Feta cheese, Kalamata olives, Greek pita wedges and our basil vinaigrette. Served with a choice of Greek spiced beef, chicken or falafel. A generous plate with Dolmas, salad mixings, Kalamata olives, Feta cheese, lemons, 2 house made dipping sauces and grilled Greek pita bread. Each glass is individually prepared with freshly squeezed lemon juice, ice, sugar and filtered water, then shaken to order, ensuring the freshest tasting lemonade. Our lemonade infused and shaken with fresh pureed fruit, depending on the season: Blueberry, Strawberry, Raspberry, Peach or Blackberry. Fruit or regular fresh squeezed lemonade blended with extra ice for a cool and refreshing drink on a hot summer day. © GOURMET FAIRE, 2018. ALL RIGHTS RESERVED.